So I’ve finally written a decoder for ClearVideo in NihAV and it works semi-decently. 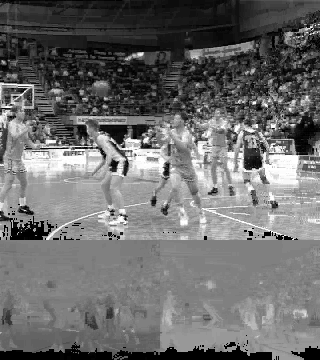 Here’s a twentieth frame of basketball.avi from the usual sample repository. Only the first frame was intra-frame, the rest are coded with just the transforms (aka “copy block from elsewhere and change its brightness level if needed too”). As you can see there are still serious glitches in decoding, especially on bottom and right edges but it’s moving scene and most of it is still good. And the standard “talking head” sample from the same place decodes perfectly. And RealMedia sample is decoded acceptably too. Many samples are decoded quite fine and it’s amazing how such simple method (it does not code residue unlike other video codecs with interframes!) still achieves good results at reasonable (for that time) bitrate. Hopefully there are not so many bugs in my implementation to fix so I can finally move to RealVideo 3 and 4. And then probably to audio codecs before RealVideo 6 (aka RealMedia HD) because it needs REing work for details (and maybe wider acceptance). So much stuff to procrastinate! Update: I did MV clipping wrong, now it works just fine except for some rare glitches in one RealMedia file. I don’t know whether it’s Sweden in general or just proper Swedish Trocadero but I’ve managed to clarify some things in ClearVideo codec. One of the main problems is that binary specifications are full of cruft: thunks for (almost) every function in newer versions (it’s annoying) and generic containers with all stuff included (so you have lists with elements that have actual payload which are different kinds of classes—it was so annoying that I’ve managed to figure it all out just this week). Anyway, complaining about obscure and annoying binary specifications is fun but it does not give any gain, so let’s move to the actual new and clarified old information. Plus it has several different ways of coding information depending on various flags in extradata. The codec has two modes: intra frames coded a la JPEG and inter frames that are coded with fractal transforms (and nothing else). Fractal frame is split into tiles of predefined size (that information is stored in extradata) and those tiles may be split into smaller blocks recursively. The information for one block is plane number, flags (most likely to show whether it should be split further), bias value (that should be added to the transformed block) and motion vector (a byte per component). The information is coded with static codebooks and it depends on the coding version and context (it’s one set for version 1, another for version 2 and completely different single codebook for version 6). Codebooks are stored in the resources of decoder wrapper, the same as with DCT coefficients tables. Now, the extradata. After the copywrong string it actually has the information used in the decoding: picture size (again), flags, version, tile sizes and such. Fun thing is that this information is stored in 32-bit little-endian words for AVI but it uses big-endian words for RealMedia and probably MOV. And the tables. There are two tables: CVLHUFF (single codebook definition) and HUFF (many codebooks). Both have similar format: first you have byte array for code lengths, then you have 16-bit array of actual codewords (or you can reconstruct them from code lengths the usual way—the shortest code is all zeroes and after that they increase) and finally you have 16-bit array of symbols (just bytes for case of 0x53 chunks in HUFF). The multiple codebook definition has 8-byte header and then codebook chunks in form [id byte][32-bit length in symbols][actual data], there are only 4 possible ID bytes (0xFF—empty table, 0x53—single byte for symbol, the rest is as described above). Those IDs correspond to the tables used to code 16-bit bias value, motion values (as a pair of bytes with possible escape value) and 8-bit flags value. You are currently browsing the archives for the Various Video Codecs category.